Assyria and the Adjacent Countries. 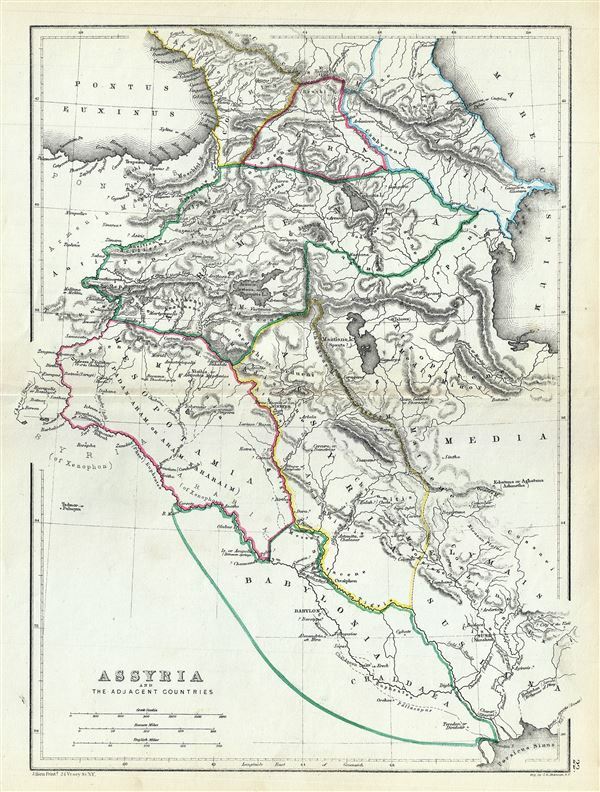 An uncommon 1867 map of ancient Assyria and its neighboring countries by William Hughes. The map focuses on the lands between the Black Sea and the Caspian, commonly known as the Caucuses. It covers the modern day countries of Georgia, Armenia, Azerbaijan, eastern Turkey, Iran and Iraq. In antiquity, most of this region was part of the Armenian Empire or Greater Armenia, a vast area of land stretching from Cappadocia and the Mediterranean to the Caspian and as far south as Persia. Later the Empire of Armenia was incorporated into the Roman Empire, the Byzantine Empire, and Persia. The map notes the important ancient cities of Nineveh (the metropolis of the empire) and Babylon (one of the most important cities in antiquity and later, the site of the death of Alexander the Great). This map was created by William Hughes, printed by J. Bien and engraved by G.E. Sherman, for issued as plate 22 in Sheldon and Company's An Atlas of Classical Geography.